The Co-operative Women’s Guild was an auxiliary organisation of the co-operative movement in the United Kingdom which promoted women in co-operative structures and provided social and other services to its members. 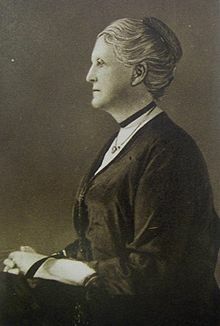 The guild was founded in 1883 by Alice Acland, who edited the “Women’s Corner” of the Co-operative News, and Mary Lawrenson, a teacher who suggested the creation of an organization to promote instructional and recreational classes for mothers and girls. Acland began organizing a Women’s League for the Spread of Co-operation which held its first formal meeting of 50 women at the 1883 Co-operative Congress in Edinburgh and established local branches. It began as an organization dedicated to spreading the co-operative movement, but soon expanded beyond the retail-based focus of the movement to organizing political campaigns on women’s issues including health and suffrage. this Conference is of opinion that the terrible method of war should never again be used to settle disputes between nations, and urge that a partnership of nations, with peace as its object, should be established and enforced by the people’s will. After World War I the guild became more involved in peace activism, concentrating especially on the social and political conditions that encouraged or gave rise to war, as well as opposition to the arms trade. In 1933 they introduced the White Poppy as a pacifist alternative to the British Legion‘s annual red poppy appeal. At this time membership of the guild was at its peak, with 1,500 branches and 72,000 members. The guild continues with several local branches, although it does not have the visibility within the co-operative movement it once did. The National Cooperative Women’s Guild closed after 133 years on 25 June 2016.